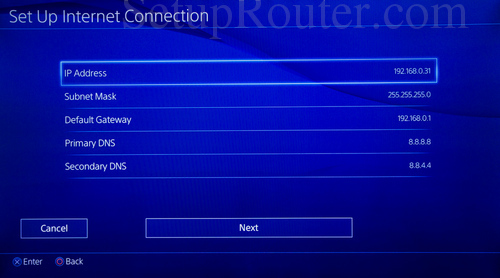 Those of you forwarding ports to your PS4 need to permanently assign an internal IP address to that gaming console. Forwarding ports on your router directs all traffic on certain ports to the internal IP address you name. If you do not permanently assign an internal IP address to your PS4 console, you may get a different IP address the next to you turn on your console causing your forwarded ports to stop working. To avoid this you can either assign an IP address in your router for your PS4 or setup a static IP address in your gaming console. 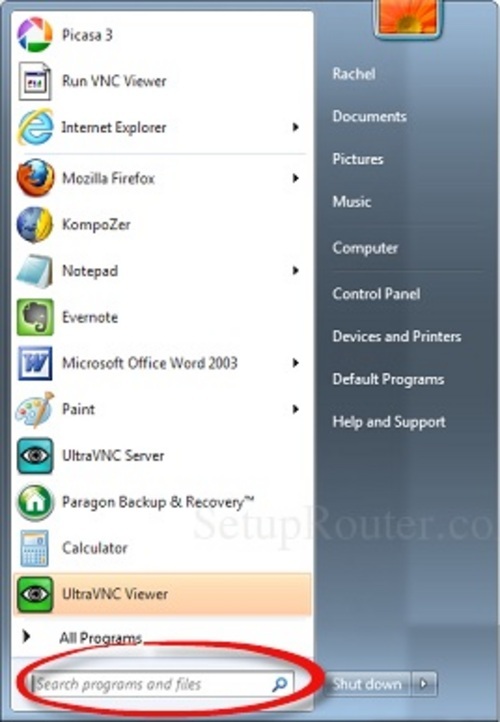 First you need to look for a way to permanently assign an IP address in your router. 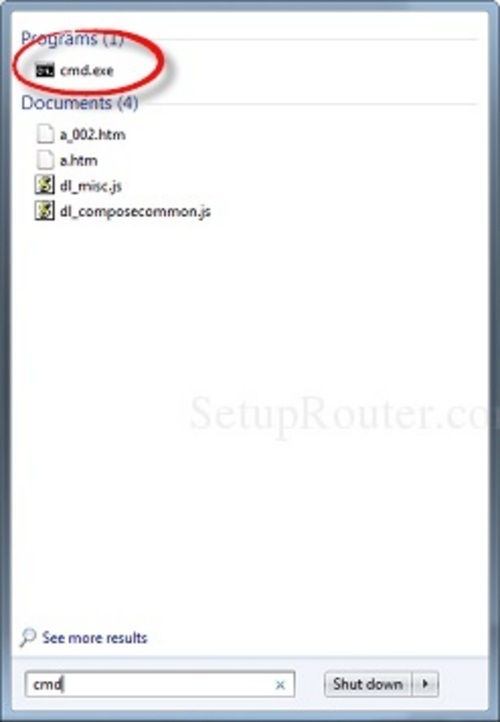 This process differs from router to router. 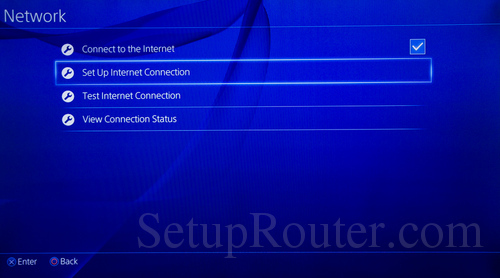 If you find that you have a router that does not allow for you to manually select IP addresses, you then have to set up the static IP address with the PS4 console itself. Static Internal IP Address refers to IP addresses that are permanently assigned. The internal IP address of your router is static. Some devices work best with a static IP address. 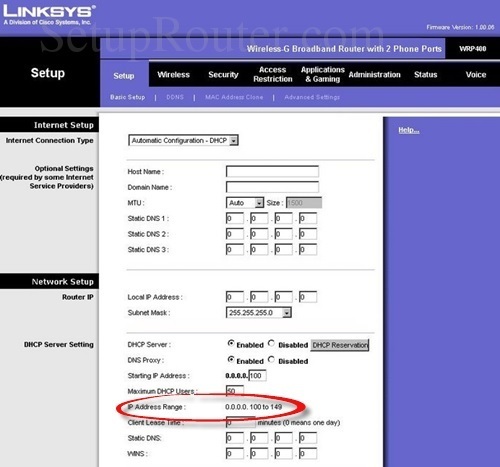 Dynamic Internal IP Address are assigned by the router and can change from time to time. This is why they are called dynamic. For example, a laptop using a dynamic internal IP address may have a different internal IP address after power is cycled to the laptop. Go to the Settings option in the PS4 Dashboard. Then select Network from the list of options. Select the View Connection Status option. On the View Connection Status page you can find the IP Address, Subnet Mask, and the Mac Address. 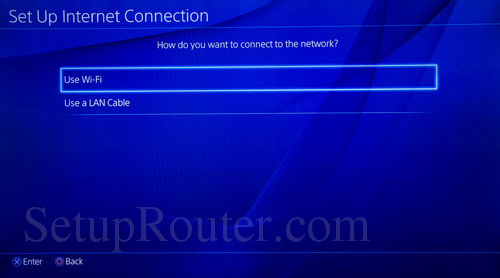 If you are using a WiFi connection to your PS4 then choose the WiFi MAC address, otherwise choose the LAN cable MAC address. (See screenshot below) Write all three of these numbers down. 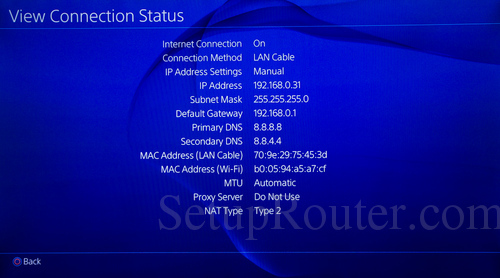 Login to your router (through your computer) and permanently assign your PS4 to that IP address. For help logging in to your router visit our login guides. In this router, there is a box to type the IP address into and then a drop down menu for the MAC address. (The MAC address of your PS4 console is a unique number and every console is assigned a different one from the factory.) Some routers do not have a drop down menu to choose the MAC address from and instead have a place to type it in. In the PS4 Dashboard, choose Settings. Wait while the test runs. It is checking your connections to make sure your console is communicating with your network and the internet. 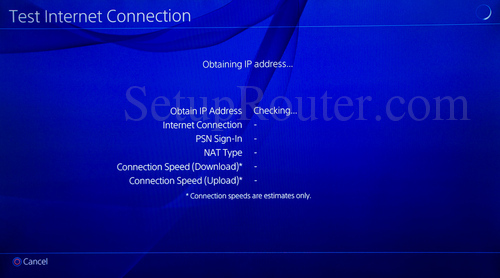 Once you have permanently assigned an IP address to your PS4 (in your router), and you have tested your connection (through the PS4 Dashboard), you can proceed to forwarding a port. For help setting up port forwards visit our router guides. Click the Settings option in the PS4 Dashboard. Then choose Network from the list of options. Finally, select the View Connection Status option. On this View Connection Status page you should see the IP Address, Subnet Mask, and the Default Gateway. Write these down, you will need to enter them in later. Login to your router (through your computer) and note the DHCP range your router uses. The DHCP range is the group of numbers that your router uses to assign internal IP addresses to devices on your network. 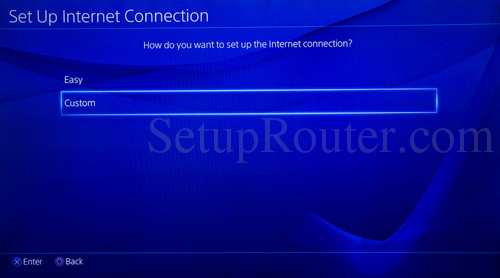 For help logging in to your router visit our login guides. 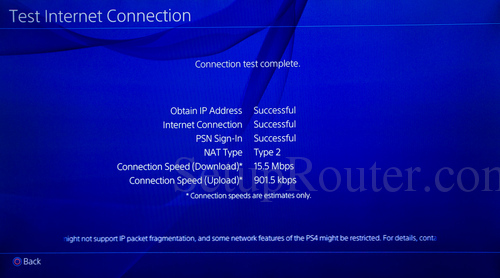 Next, you need to pick a number between 2 and 254 that is outside of your router's DHCP range to assign to your PS4. If your router's DHCP range is 200-254 you could choose a number between 2 and 199. Now click on cmd.exe (which should be listed over the dialog box). A black window with white text should open. If you ping an address and do not receive a reply, then the IP address is available for you to use. (See example above.) If you do receive a reply then that IP address is in use and you will have to try a different one. Below is an example showing an address that has already been assigned. 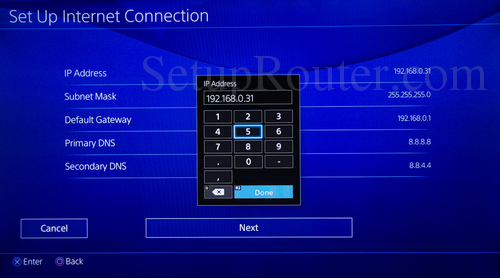 Now, go to the PS4 Dashboard to set the internal IP address to the number you have chosen. First, click the Settings option. Next, the console prompts you to choose how you will connect to the internet. Your choices are Use a LAN Cable, meaning you have a wired connection or Use Wi-Fi. You are now on the IP Address Settings page. Choose Manual. You should now be on a page like the one you see above. Highlight the IP Address and click the X button on your controller. A black box with a number pad then appears. Enter in the IP address you have chosen to use here. Finally, select Default Gateway and enter the number you wrote down earlier for the gateway (see Step One). This is your router's internal IP address. When you are finished, click the Next button at the bottom of the screen. The next screen is the MTU Settings, go ahead and click automatic here. A page like the screenshot above should then appear. Go ahead and click Test Internet Connection. 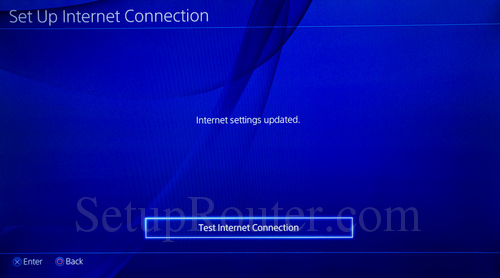 This test checks your Network, Internet and PS4 connection status. Wait while the test runs. When the test is complete and successful you will see a screen like the one you see above. You can set up your port forwards to your PS4. For help with port forwarding you can check out our router guides.